San Luis Obispo County, California(May 21, 2015)â€“ San Luis Obispo County, located halfway between San Francisco and Los Angeles on Californiaâ€™s naturally beautiful Central Coast, offers many new reasons to visit this summer and fall, from new and renovated hotels to fascinating tours.As part of the ultimate California road trip, San Luis Obispo County features culinary, cultural and coastal attractions and activities. Stay for a weekend or plan a week with all the activities and new accommodations highlighted below.For more trip planning information on the Central Coast, which was named among Lonely Planetâ€™s 2014 Top 10 US Travel Destinations (#4), check out www.visitsanluisobispocounty.com. INTRODUCING THE NEW MORRO BAY ADVENTURE PASS! Bring the whole family to explore the ocean and enjoy a â€œKids Sea Life Packageâ€. Starting at $249 in Avila Beach and $179 in Pismo Beach, the package includes overnight accommodations in a suite with plenty of room for the whole family, complimentary breakfast each morning, one dolphin-shaped backpack filled with a stuffed sea animal, ocean life coloring book and other ocean-oriented items, along with one complimentary kids admission to the Central Coast Aquarium. Enjoy the feeling of satisfaction knowing that youâ€™re helping to support a precious community resource and education center, because with each package sold Martin Resorts will donate $5 to the Central Coast Aquarium. NEW RESTAURANT SLATED TO OPEN IN PISMO BEACHOld Custom House Inc., the restaurant division of Compass Health Inc., is opening the eatery at 175 Pomeroy Ave., the site of the former Pierside Seafood. The family-friendly restaurant will feature outdoor decks and panoramic ocean views. A bar and grill called Wooly&apos;s, will occupy the downstairs space. A separate seafood restaurant and bar will occupy the upstairs. Mistura, a modern Peruvian eatery, recently debuted in Paso Robles.Aptly named â€œmixtureâ€ in Portuguese, Misturaâ€™s menu offers a fusion of Native Pre-Columbian and Incan heritage with Chinese, Italian, Japanese and Spanish influences. Chef Nicola pays homage to traditional Peruvian cuisine by incorporating native Andean ingredients into his dishes along with locally-sourced free range meats, sustainable seafood and fresh organic produce. www.MisturaRestaurants.com. Sunset SAVOR The Central Coast, Californiaâ€™s premier food, wine, travel and lifestyle event, revealed details surrounding its all-new opening night experience, Strings at Sunset, to be held at Vina Robles Amphitheatre on Thursday, September 24, 2015. FeFFFaturing theatrical performances from award-winning artists String Theory and DJ Violinist SPAGS, attendees will also enjoy wine pairings from the 2015 Sunset International Wine Competition winners, celebrity chef tastings, and more. For more information visit www.savorcentralcoast.com. For more information on planning a trip to San Luis Obispo County, go to www.VisitSanLuisObispoCounty.com. About Visit San Luis Obispo County: Visit San Luis Obispo County is the destination marketing organization for San Luis Obispo County, promoting the area as a preferred tourism destination for regional, national and global visitors through advertising, marketing, public relations and group sales. Highlighted by its culinary, cultural and coastal aspects, San Luis Obispo County is internationally recognized as a premier wine, food and life-style destination on California&apos;s Central Coast. Visit San Luis Obispo County has a member base comprised of over 500 tourism industry-related businesses including lodging properties, restaurants, wineries, golf courses and retail stores. 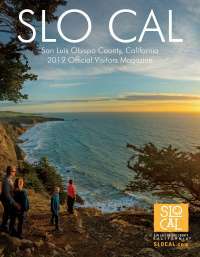 Visit http://www.visitsanluisobispocounty.com for story ideas or to request a county Visitor&apos;s Guide. For more information, please contact us at 805.541.8000 or kyleej@visitsanluisobispocounty.com.